Summer may be winding down but there are definitely a few more beach/pool days on the calendar and getting your beach bod together is as important now as it was on Memorial Day. The key to looking great (besides keeping the body as tight and toned as possible or in my case sucking in for dear life) is having great, clear skin. Unfortunately for many people (especially dudes) back acne is a major problemo. According to Dr. Susan Evans, chief of dermatology at Skincare Physicians of Beverly Hills, "facial and back acne develops in a similar manner and expresses itself in similar lesions". Dr. Evans (a health and beauty expert on shows such as Oprah, Dr. Oz, and The Today Show) does say that the "sebaceous glands (glands that secrete oils) on the back are larger and produce more oil than those on the face. These larger glands can produce more severe lesions such as nodules and cysts more frequently. The skin on the back is also much thicker than that on the face". That means that if you're already prone to acne on your face, you could find yourself with some less-than desirable large and in charge cystic-acne like zits on your back. Who feels confident with those around? Dr. Evans, says back acne or "bacne" can also be caused by irritation of the skin and aggravated by anything that rubs against it such as tight fitting clothes, bra straps or back packs. Unfortunately, this type of acne, also known as "acne mechanica", will get worse with moisture. So, if you're sweaty (especially in the humid weather) and mix that in with repeated rubbing against an irritant, your condition will likely worsen. Frustrating right? -Your first step is to make sure your clothes aren't the culprit and you aren't specifically allergic or aggravated by particular fabrics. Make sure to cleanse your skin with an antibacterial wash that will remove surface bacteria. Try Dial Clean & Refresh Antibacterial Body Wash in Mountain Fresh ($5.99, Walgreens). -Then, invest in a good back scrubber ($6.99, drugstores) and loofah ($2.99 drugstores). Not only should you be using an antibacterial wash and acne products that contain Salicylic Acid and Alpha Hydroxy acids, you should be scrubbing and exfoliating the surface area daily to slough away dead skin and prevent your pores from clogging which causes breakouts. -Next find a body wash and/or exfoliating scrub that targets acne issues. I'm a fan of Neutrogena's Body Clear line that includes their Pink Grapefruit Body Wash, regular Body Wash and Body Scrub ($6.99, drugstores). The scrub and washes contain the maximum strength dermatologist recommended amount of Salicylic Acid (a proven acne-fighting ingredient) and none of them will dry out your skin. Yu-Be Foaming Skin Polish ($18.00, Sephora.com)- This super gentle yet super effective scrub uses rice bran and walnut shell powder to slough away dead skin on your face and body. I swear by this stuff and it's transformed my skin. AHAVA Pure Spa Dead Sea Liquid Salt ($22.00, Skinstore.com)- The formula, a 2008 CEW Beauty Insider Finalist, contains an intense concentration of Dead Sea minerals that regenerate the skin and detoxify its tissues (like a regular scrub would). For many people, sea salt (like ocean water) is a great remedy for clearing up acne. This will mimic those effects. Be careful to not use this on your face and keep it away from your eyes and open cuts. The high concentration of sea salt will make open wounds burn. 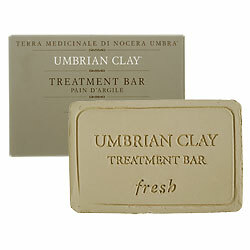 Fresh Umbrian Clay Treatment Bar ($38.00. Sephora)-A purifying treatment bar for the face or body. Sephora reviewers LOVE this versatile tool, which can be used as a deep cleanser, an instantly detoxifying mask, or a spot treatment to heal blemishes and irritation. The high mineral content soothes irritations and reduces breakouts. 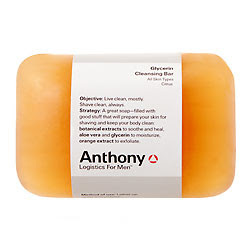 Anthony Logistics For Men Glycerin Cleansing Bar ($8.50, Sephora)- A gentle, vegetable-based cleansing soap for the body and the face that's suited for acne-prone and sensitive skin. It contains orange extract, a natural alpha-hydroxy acid and smoothes the skin thanks to its natural antiseptic qualities. -Once out of the shower use a toner that will get rid of any other oils, impurities and dirt left behind. Try La Roche Posay Effaclar Toner Astringent Lotion ($20.90, CVS & drugstore.com). The effective toner might be too harsh on the face (if you have especially sensitive skin) but the thick skin on your back will benefit from its pore de-clogging treatment ingredients. -Finally, if you need immediate treatment for an already erupted mound, find a spot solution that contains benzoyl peroxide. I'm a fan of B. Kamins Medicated Acne Gel 10% Benzoyl Peroxide ($28.00, skinstore.com). It effectively treats moderate to severe acne and won't dry out the skin. Plus you only need a tiny amount per blemish, so the tube lasts a long time. So, if you want a blemish-free back this summer take these treatment tips to heart. *A home remedy I've heard works but haven't tried is putting vinegar in a spray bottle and spritzing it all over your back. Not sure how it works or how effective it is but could be a good home-remedy option! If you don't mind the potent smell! Regarding your home remedy...I've tried the vinegar and it does seem to help. Sometimes, I cut it with some water to help with the smell. The smell will dissipate after a bit but I usually only do it in the evening after I've showered and then I rinse off a bit in the morning just in case...so that there's no residual smell...Also, if anyone has a problem with acne scars, using palmarosa essential oil diluted with water in a spray bottle helped me with acne scars. They're not completely gone but it has helped to diminish them quite a bit.